The leaves are changing colors, the air is getting crisp, the pumpkin spice lattes are here.Fall is in full swing, and that means Thanksgiving isn’t far off. If you’re hosting Thanksgiving dinner this year, then you’ve probably got your hands full, deciding where to buy the turkey — and how big it should be — how many sides dishes and pumpkin pies to make. Although the food takes center stage at Thanksgiving, every good host knows that the table settings and home decor also go a long way toward making the celebration special. Of course, everything you need to set your Thanksgiving table is available online from a host of retailers. But buying your napkins, tablecloths, salad tongs, centerpieces and serving platters from a purveyor of ethical home goods like UNICEF Market is a guaranteed way to make the holiday much more meaningful. 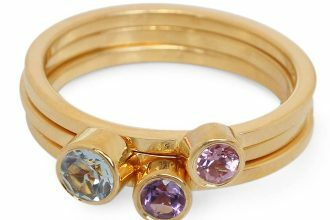 The artisan makers are fairly compensated, your support helps them grow their businesses, and handmade products are more eco-friendly than those created by factory processing. If there’s any time of year to shop in a way that helps others, surely it’s the Thanksgiving season. What better way to give thanks for what you have than to give back? Here are some one-of-a-kind items from UNICEF Market that will make your celebration all the more special because proceeds from every purchase support artisans — and UNICEF’s livesaving programs for children around the world. If there’s one item you need for a big Thanksgiving dinner, it’s a serving bowl – or more realistically, a few of them. 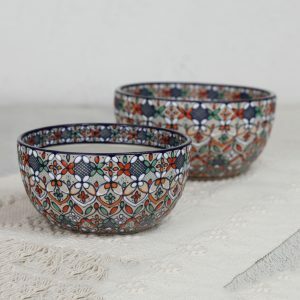 This set contains bowls of two different sizes, both decorated with a multi-colored floral motif. The bowls are hand-painted by Mexican artist Javier Servin, who has expanded his first ceramics workshop, which employed just two people (himself and his wife), to a three-workshop operation, which today employs over 30 artisans. 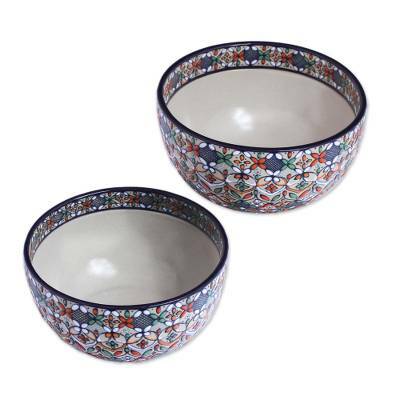 Serve up your salad, stuffing, mashed potatoes, or any other Thanksgiving side dish in these bowls to make this year’s fiesta a celebration to remember! When you have many people to seat at your Thanksgiving table, table runners can be a god send. 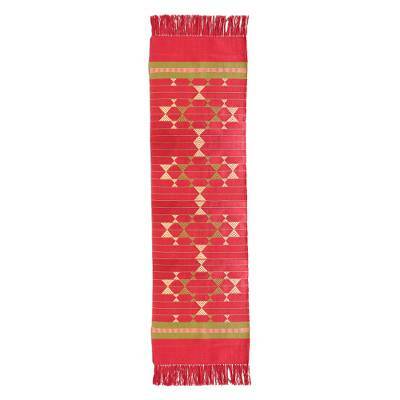 Used instead of place mats — on their own or over a table cloth — a festive table runner allows you to vary the size of each place setting so more friends and loved ones can fit around your table. The runner below was made in India by artists from UMBVS, an NGO collective of traditional weavers, now employing men and women — who by tradition were formally barred from the craft — in almost 100 villages. Dinner will taste all the sweeter served on this runner, a product of the movement to achieve gender equity in India. Your Thanksgiving sommelier will tell you a set of red wine glasses is a must-have. 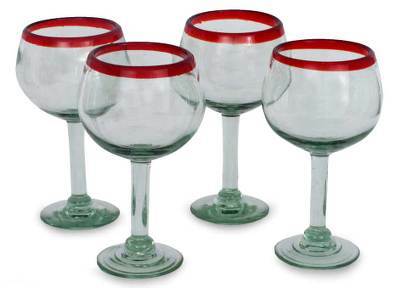 Each goblet in this set is made completely from recycled glass with a bright red rim for festive flair. Hand-blown by Mexican artisans Javier Gutiérrez and Efrén Canteras, these glasses are perfect for serving up red and white wine, rosé and non-alcoholic options for guests who don’t drink. 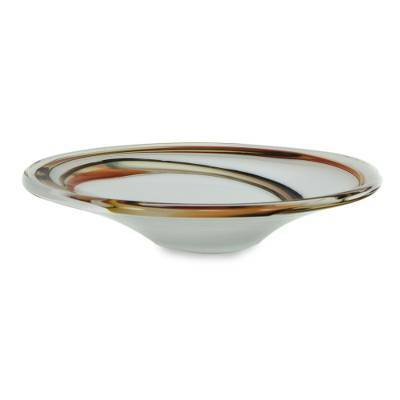 Every Thanksgiving dinner table needs something decorative in the middle, and this unique glass bowl will make a great foundation for your table’s centerpiece. Hand blown in Brazil, it’s actually based on a traditional style from the Italian island of Murano, which is renowned for its long history of glassmaking. The connection between Brazil and Italy might not be obvious, but many Italian families, including those from Murano. immigrated to Brazil in the early-20th century. The first glass master to come from Murano passed on his knowledge to Antonio Carlos and Paulo Molinari, creators of this bowl. Filled with flowers, fruit or holiday gourds, this lovely bowl, which is shot through with autumnal accent colors, will add interest and beauty to your table. Of course, every culture has its own unique ways to give thanks. Incorporating one from another country is a great way to give thanks for the peaceful traditions of gratitude which connect us all. 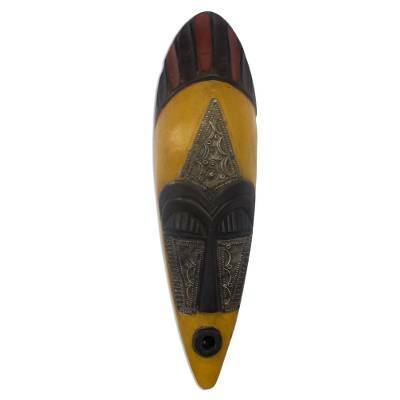 This mask is from Ghana, where artisan Robert Nortey makes carvings from wood indigenous to his home. This Sheida mask, used to give thanks, reflects the traditional spiritual customs of the Ga people, an ethnic group in northern Ghana, who use it to show appreciation to their gods. Hung in the dining room, it’s sure to be a conversation starter — and hopefully a reminder of how much we’re all the same.